8.5 billion animals are killed for food each year in the United States, 99 percent of these animals are born, bred and killed in Factory Farms. A Factory Farm is a large industrial operation that raises large numbers of animals for food. The focus of a Factory Farm is to make a profit while remaining efficient at the expense of the animal’s welfare. The Tyson brand is a large supporter and buyer of Factory Farm animal products. Unclean air and unnatural lighting stem from the confined living spaces that the animals are made to live in. Waste from the animals piles up in pens that they usually cannot turn around in. Unnatural lighting simulates an unnatural day-length to promote fast growth and desired behavioral traits. An unnatural rate of growth is common among Factory Farmed animals. Fast and disproportionate growth is preferred in order to increase production. The increased growth rate can result in chronic pain, mobility problems and heart problems. However the animals that have these crippling problems are denied any kind of veterinary care. Sick or injured animals are left to die a painful death or killed inhumanely. Female animals are subject to an unnatural reproductive cycle. They will spend virtually their whole lives pregnant, thus causing chronic stress. Surgical mutilation and antibiotic abuse are also common practices. Chickens sometimes have their beaks removed to stop them from pecking each other to death. Male animals also sometimes have their testicles cut off without anesthetic. Antibiotic abuse is common and can be harmful to human health, as it can cause drug resistant strains of bacteria and spread among humans. Denmark has banned the abuse of antibiotics in their food supply and is experiencing agricultural success. Damage to the environment is also possible. Waste runoff from Factory Farms can pollute nearby water, land and air. 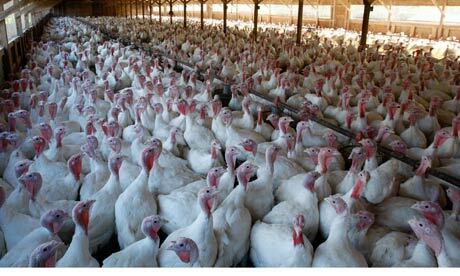 These farms have also become breeding grounds for Salmonella and E. Coli. Nowadays most Chickens or Broilers who end up on dinner plates grow within seven weeks of birth into maturity. At such a high rate of growth these Broilers are unable to support their own weight and spend most of their lives laying in their own waste in cages of up to 30,000 or more. In 2012 it was determined that Cattle Factory Farms are highly concentrated in Kansas and Nebraska. In Michigan Ottawa, and Allegan county have a moderate density of Cattle, but has a high density of Factory Dairy Farms throughout the state. Pigs are farmed in a high density all throughout the state of Iowa.